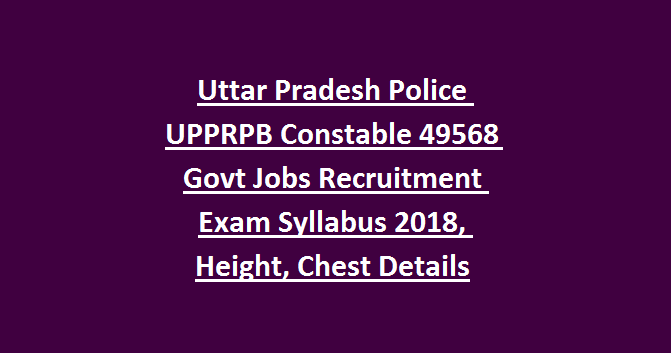 vacancies in this UPPRPB Constable recruitment 2018. 18208 vacancies are for PAC Constable jobs. All these PAC Constable vacancies are reserved for Male candidates only. Candidates selection will be based on written exam, physical tests and documents verification for this UPPRPB Constable Civil/PAC jobs recruitment 2018. 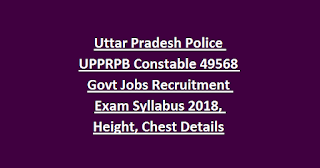 Physical Test (Height, Chest, Running) details for this UP Police Constable Bharti is updated below along with Exam Pattern and Syllabus pdf. There are total 49568 Constable Civil, Constable PAC vacancies are in this Uttar Pradesh Police Bharti Recruitment Board. As on 01-07-2018 age limits for Male candidates is 18-22 years and for female candidates 18-25 years. 12th pass or intermediate qualified candidates are eligible for this UPPRPB Constble recruitment 2018. PAC, Constable jobs will be based on written exam and physical tests, documents verification. Written exam for this UPPRPB will be conducted for 300 Marks. Online applications are accepted for this Constable Civil and Constable Armed vacancies Bharti in Uttar Pradesh Police dept. Official website to apply online are www.UPPBPB.gov.in.